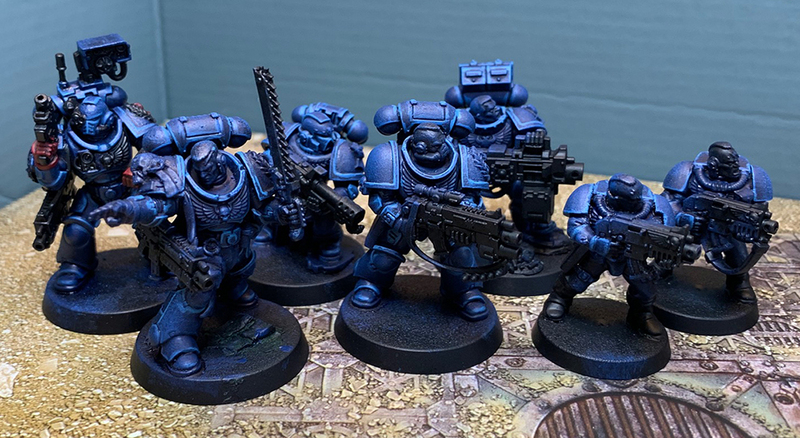 So as we head into the end of March, I thought I would sneak in an update on the Crimson Fists' progress. I had raced ahead with my Comms marine, even getting so far as to test some red and black out the blue overspill. This did however leave the rest of the team lagging far behind. I got the bulk of them up to a basic blue coat, but it took a while for the Veteran Sergeant (with all his greenstuff additions) to catch up. Last night I put in a shift to make sure they were all finished with the blue, with final highlights (I may got back with a touch of white at the end) and ready to see red! With the grinding bit over I'm looking forward to getting stuck into some details to bring their characters to life. Alas, with Easter fast approaching, my wife has decided that now is the time to tackle the redecorating of the living room – the second largest room in the house, and the one we've been putting off since we moved in five years ago. With that in mind I expect progress to be slow, but I hit my self-induced deadline of the end of the month for the armour to be complete. OMG, I may actually painting some models here people – I may actually be able to tick something off the Hobby Bingo list (soon)! And very smart they look too! Rotten luck about having to hit pause whilst the decorating is underway - my least favourite thing in the world! Complicated futher by the need to get some plastering done! Painting my Kill Team Terrain… with a Sponge!